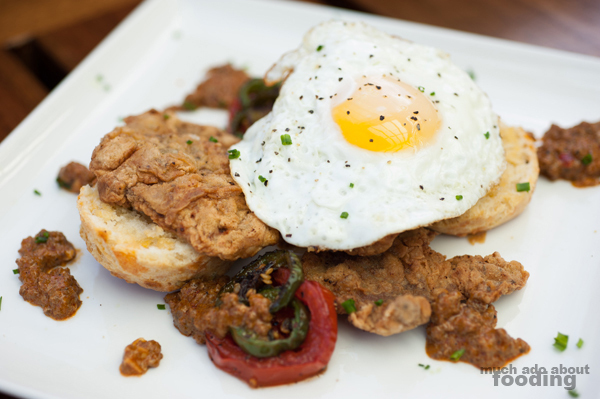 It is no secret that Orange County people are into their brunch. It is a weekend affair that many love indulging in so it is no surprise that plenty of the bigger restaurants offer it along with an accompanying menu replete with heavy, savory dishes. The newly opened Del Frisco's Grille in Irvine has hopped onto this trend as well with large plates ready to make you end your day by the end of morning. In addition to their regular lunch menu items being available for ordering, Del Frisco's also provides a few choice dishes on a separate brunch menu that you cannot get any other time. 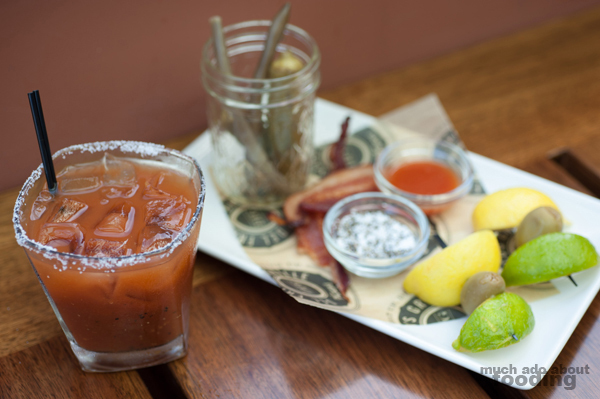 The restaurant also features a handful of libations that can be enjoyed by yourself or shared with others; the most notable is the customizing Bloody Mary "play set" of ingredients to personalize your drink. 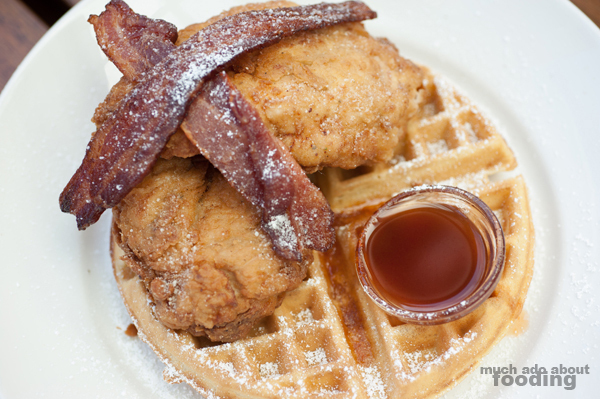 We visited on invitation one morning to see what else the brunch menu had in store. 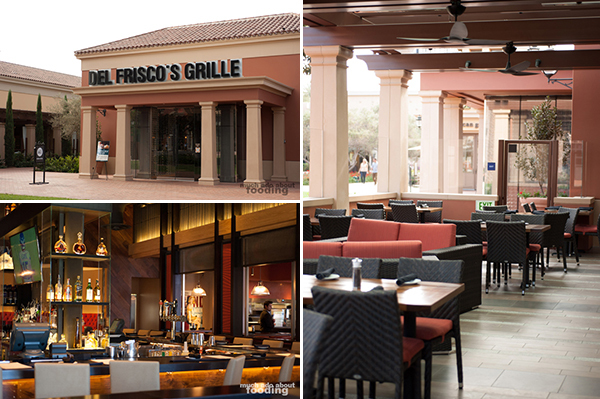 Located at the Irvine Spectrum, Del Frisco's Grille is one of the newest additions to the area and in this case, the first location of its group to be in Orange County. We had previously visited the Del Frisco's Grille in Santa Monica for their Sommelier Saturdays event but otherwise, the restaurant is generally new to the area. Founded and based out of Texas, Del Frisco's is a widely known chain with a higher price point and consumer focus than say, a nationwide casual dining joint. The Irvine location's interior is intimate in mood but spacious in size. There is also a welcoming wrap-around patio that really gives off the vibe that this is meant to be a restaurant for quite the good time with a group of friends. To properly start off brunch, we dove for our drinks. Their libations menu allows for glasses, carafes, and bottles of wine in the ranges of $9-15, $17-37, and $34+ respectively. This easily reflected the large wine focus the restaurant has and shows off; the entrance is an enclosure of glass-confined shelving stacked with wine bottles! 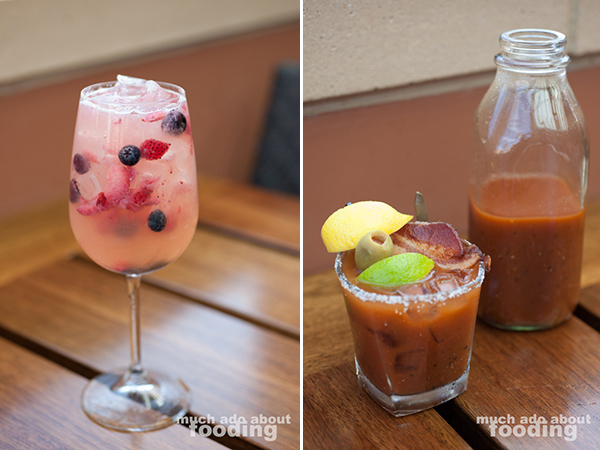 The brunch cocktail choices we made were for their Build Your Own Bloody Mary ($7/$19.50 - housemade Bloody Mary mix, Tito's handmade vodka, and plate of fixin's) and White Sangria ($6/$8 - Pinot Grigio, white peach puree, peach schnapps, and fresh berries) with other options being mimosas and screwdrivers. The carafe for the Bloody Mary seemed enough for four drinks, and the plate of fixin's made the experience quite interactive. 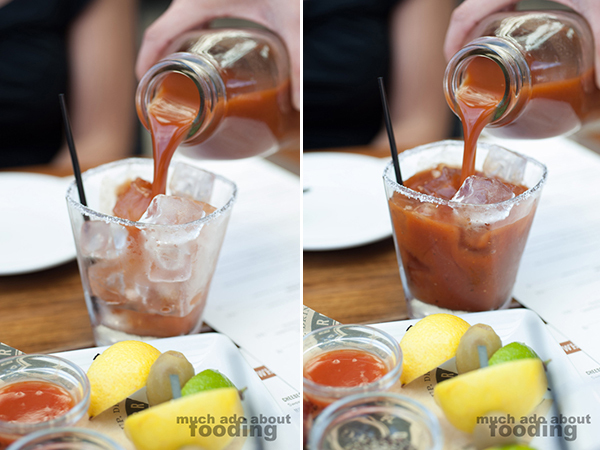 We found the Bloody Mary to be spicy for a Bloody Mary, and it was a difference that we enjoyed. The extra fixin's were a good touch to it all with the pickled vegetables and even bacon. As for the sangria, this drink was too easy to finish off. The blend was well-balanced and the flavors melded together perfectly. Lovely choice for a sangria! The starting plates of Iceberg Lettuce Wedge ($8 - bacon, tomato, and blue cheese dressing) and Ahi Tacos ($17.50 - tuna tartare, avocado, and spicy citrus mayo) were in our next round of food. 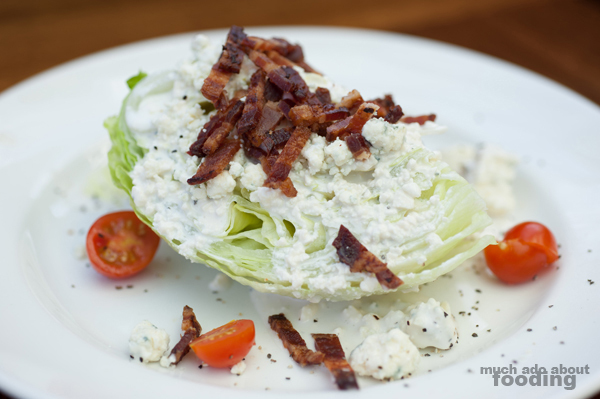 I've never been a fan of iceberg lettuce myself since the vegetable is usually quite tasteless, and I felt the same way with the base of this salad. There was plenty of blue cheese dressing (more cheese than dressing though) to cover the whole lot and bacon to give a smoky saltiness but overall, I would have liked more pizzazz to the dish. Perhaps they can slightly char/grill the lettuce? Not my style for sure! In stark contrast were the ahi tacos that made me close my eyes in happiness. This unique presentation turns the typical tuna tartare dish into a handheld mouth-party piece. 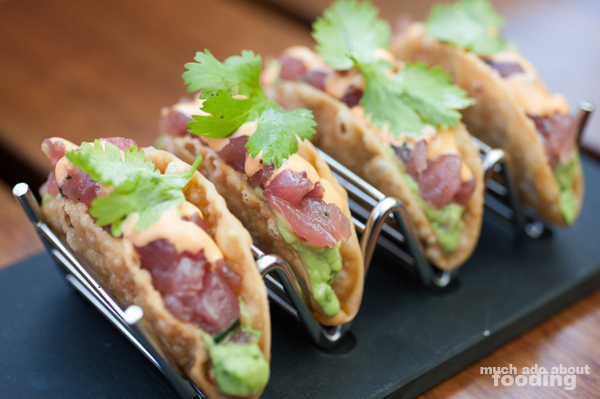 Whereas other places may serve the tuna atop scattered tortilla chips, this one enveloped the whole combination into adorable taco form with fried tortillas and really shone with its fresh and bountiful serving of tuna, guacamole, and spicy mayo kick. Sign me up for these again and again please! With the appetizers being items that are readily available on their normal menu, we were ready to experience what their brunch had to offer. Out came the Chicken-Fried Steak & Eggs ($17 - jumbo biscuits and chorizo gravy) and their Southern Fried Chicken & Waffles ($17 - spicy maple syrup and thick-cut hickory-smoked bacon). Other brunch items include the likes of Banana & Marscapone-stuffed French Toast and Crabcake Benedict so you better arrive hungry. The chicken-fried steak had a tasty batter on it but was perhaps just too thin for its treatment as the plate ultimately was on the drier side of dishes. We would have liked to have seen more gravy to help with the aridity which admittedly got some assistance from the runny egg but that was it. Conversely, the fried chicken was quite moist and worthy of remark. The bacon tasted like it had been candied so we only had a few bites of that one but the chicken was superb. I especially enjoyed the spicy maple syrup that came with it all. The waffle was fluffy and not too sweet so it was a good holder for the juicy chicken and spicy syrup. If you like sweet bacon too, you'd be all set for this dish! Now, because we seemed to have never-ending pits for stomachs, they decided we just had to get a bit of their Filet Mignon 8oz ($38) with hefty cast-iron skillet sides of Pan-Braised Wild Mushrooms ($8) and Truffled Mac & Cheese ($8.50). Duc was mightily impressed with their branded steak knives which were legitimately sharp and weighted unlike some restaurants that give you dull blades. The piece that came out for us was a beautiful medium rare with a very lovely crust all around. I love getting steaks that find the balance between a charred, seasoned crust on the outside with a soft red on the inside. 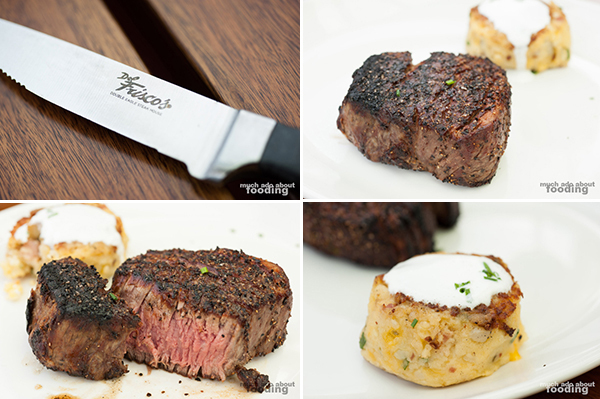 It is no surprise that the company as a whole for Del Frisco's Restaurant Group has a background and history in steaks. 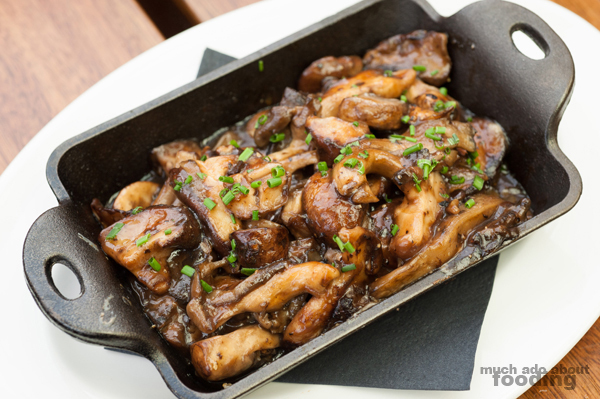 The mushrooms that came with the dish were very savory and smelled heavily of its own umami, having been braised in presumably its own liquids. 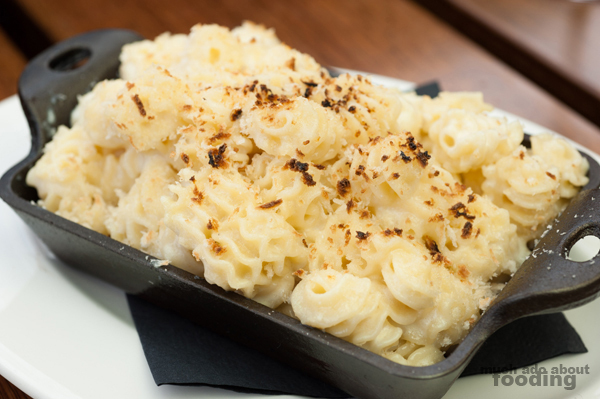 The mac and cheese was only the drier side so the ultimate cheese lovers should not opt for this side dish; however, if you are a fan of pasta (and they chose a great shape for mac and cheese purposes - radiatore), this is one you'd enjoy, especially with its truffled scent. To end out the feast, our two desserts were their The Adult Milkshake ($11 - Nocello walnut liqueur, creme de cacao, chocolate liqueur, and vanilla ice cream) and Coconut Cream Pie. I would have been completely content with just sharing the milkshake because it was extremely thick and heavy in the stomach with how rich the ice cream was (it came with a thick straw!) and the amount of booziness in every sip. Creamy and sweet, this cocktail dessert had well-incorporated flavors and a subtle but pleasant touch from the walnut liqueur. Then onto the pie! The masterpiece! The creme de la creme (somewhat literally)! When our waitress mentioned coconut cream pie, I was not too excited but once we saw it come out, we were very intrigued. Fragile curled columns of white chocolate stacked skyward on top of the pie to form a fortress of dainty creaminess above the coconut cream below. The crumbly crust seemed to have a coconut tinge to it too, and the cream was full of coconut shavings inside, giving texture to an otherwise smooth thickness. 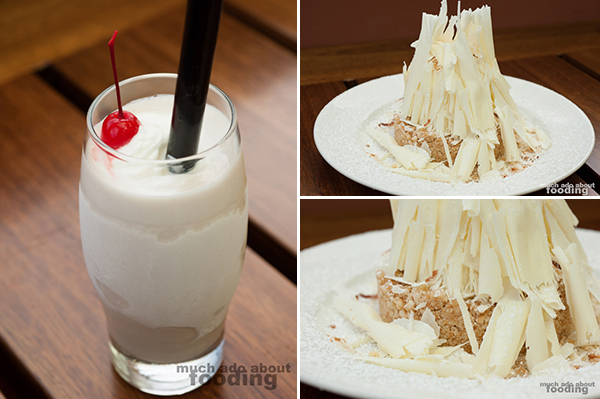 I loved how it was not even sweet as much as it was just a highlight of coconut's actual taste - refreshing and milky. If you're going to order a dessert after a slew of heavy foods, you should try your mouth at this one! There were some improvements on the dishes that could have been made but overall, this was a great brunch experience and especially for those who need a variety of options with a group of friends. Find Del Frisco's Grille in Irvine at the Irvine Spectrum or more specifically, at 772 Spectrum Center Drive, Irvine, CA 92618. Enjoy!